A Marine Corps veteran was able to stop a man early Tuesday, March 12th from nearly kicking a woman to death. It happened near 102nd and Lincoln, and Wisconsin’s concealed carry law made his efforts possible. You are your own first responder. I don’t know why this concept is so hard for people to grasp. No one bats an eye at the thought of having a fire extinguisher in their house – it’s common sense that if a small, manageable fire breaks out, having the tools to quickly and effectively battle that fire handy prevents massive loss later. It certainly doesn’t mean you want to pretend you’re a firefighter. Ditto having a good first aid kit – if something happens, even in the best circumstance help is going to be a few minutes away, and having tools to handle minor medical emergencies is part of a good safety net. It doesn’t you think you’re an EMT or a doctor. Yet you mention having a firearm for self-defense and all of a sudden you’re a vigilante or a cop wanna-be. 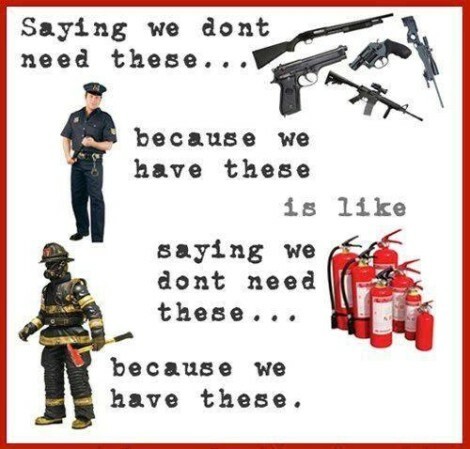 I have yet to have anyone on the anti-freedom side explain to me why having a firearm handy in case of a violent encounter is any different than having a fire extinguisher in case of fire or a first aid kit in case of accident. The firearm is a tool for a specific scenario; it is not a magic talisman to prevent violent encounters from happening but to assist you in surviving the encounter with – ideally – minimal injury to yourself. Why do we treat self-defense as less important than fire safety or first aid? The laws that forbid the carrying of arms are laws of such a nature. They disarm only those who are neither inclined nor determined to commit crimes…. Such laws make things worse for the assaulted and better for the assailants; they serve rather to encourage than to prevent homicides, for an unarmed man may be attacked with greater confidence than an armed man.